Hi, Good Morning, Thank you, friends and viewers. 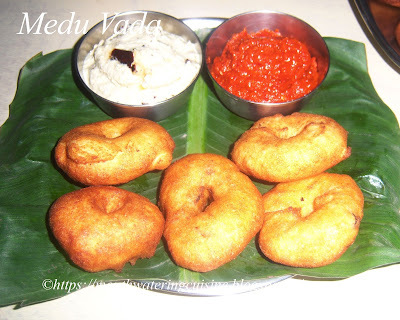 Today I will post how to make medu vada or gare. Medu vada or garelu as Telugu people call them are round disc-shaped or donut-shaped fritters made with lentils are a very famous dish in South India. They are made during every festival. Urad dal or black gram or Minapapappu is the main ingredient in this. Soak it for one or two hours and grind it to a fine smooth batter. Softness of the vada depends on the batter itself. So we need to be very careful while grinding. We can use mixer grinder or wet grinder. But add very less water while grinding. Plain urad dal fritters are called as vada. Adding onions, chillies and cumin seeds are ones choice. Masala vada, Poha vada, Aratipuvvu vada, Bread vada, All flour vada are different variations among them. These garelu or vada are the base dish for making pulusu garelu, sambar vada and dahi vada or perugu vada. Making soft, crunchy and dry, non-greasy vada is an art. Only experts can make such kind of vada or garelu. I have learned this art from Susila my friend. She is an expert in making garelu. She makes very tasty and non-greasy garelu or vada. Medu Vada or garelu disc-shaped fritters made with soaked urad dal. Wash and soak urad dal/Black gram for three to four hours. Add some portion of the dal to mixer grinder or to wet grinder. While adding very little water grind it to a fine and smooth batter. Becareful while adding water. Take this batter into a bowl and aerate it with your hands. Aerate it till we get the desired consistency. Batter should be fluffy and we should be able to make small ball out of it, without it sticking to our WET HANDS. If unable to make a ball out of it, means it is very loose and need to add rice flour. But instead of making such manipulation with it better grind with very less water. Add only 3 to 5 tablespoon of water or till the mixer or grinder moves easily. Heat oil in a deep frying pan. Let the fumes come up, simmer the flame. Wet your hands and grease a oil sheet or it is better if we get banana leaf it is better. Take a lemon sized portion of the batter onto the oil sheet or banana leaf. Flatten it lightly and make a small hole in the centre. Slowly and carefully transfer this vada onto your right hand fingers by lifting the oil sheet from one corner, preferrably left corner. Drop this vada carefully in the hot oil. Repeat the same with the batter. Drop 4 to 6 such vadas in the oil. Increase the flame to medium high or to high. Take them off from the oil and place on an absorbent paper. Rpeat the same with the rest of the batter or till your are done up with the batter. Serve medu vada with coconut chutney and erragadda karam. Or dip them in the sambar and enjoy! !